Caffeine has been described as the most widely used and most popular drug in the world, and as with all drugs, there is some potential for addiction. If you are a regular coffee drinker and typically have a few cups a day, you know that going without can result in bad headaches, as well as a feeling of tiredness. For some people, however, these symptoms can be severe. In the new edition of the American Psychiatric Association’s Diagnostic and Statistical Manual of Mental Disorders, both caffeine intoxication and withdrawal are included as mental disorders. They aren’t always severe enough to be a true mental disorder for most of us, but they are termed this way because they can actually be significant enough to “impair a person’s ability to function in daily life” in some (fortunately relatively rare) cases. 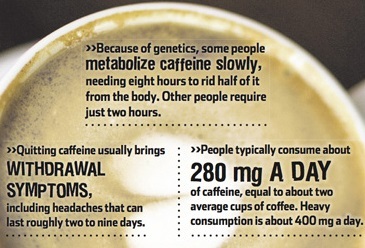 Caffeine intoxication is also known as an overdose of caffeine. Symptoms can include jitters and increased heart rate. Withdrawal typically is associated with intense head pain and sometimes flu-like symptoms. Caffeine is still associated with plenty of health benefits, but since it is appearing in more and more products – such as energy drinks and foods, in addition to coffee and tea – people sometimes do consume more than they are aware of and labeling these two conditions can help bring a little more awareness to consumption.